Every parent is different.Having said that a parent will be a parent at the end of the day.Be it of any nationality, religion or tribe. Every parent wants the best for the child and works hard day and night to be able to do so. In today’s modern world we are too busy in ourselves.The parent in us is somewhere getting lost under the societal pressure of being perfect.There have been numerous tribes around the world.They are parents too. Babies in tribes are breastfed until the age of 4 or 5.Their parents know that the healthiest food for their babies is undoubtedly breast milk.They feed their children as and when they are hungry.There is no fixed time or a schedule that they follow.And unlike our children, children in tribes fall ill less often, have a stronger immune system and are happier. Waking up to feed a newborn, again and again, can be exhausting.And in this case running to the baby’s nursery is a different level of task altogether.In such a case co-sleeping comes to the rescue.It is just amazing how God has designed mothers body to be super responsive to their babies, even when the mother is asleep.When my baby sleeps next to me, I notice his slightest of movements, even I don’t know how.Even I personally love co sleeping with my daughter as it gives me peaceful nights of sleep. I personally have never worn a baby carrier but It seems to be totally up with the idea.The people in tribes don’t have amenities like we do but I don’t really seem that they are missing out on something.They always have their children wrapped around them no matter where they go.And their kids are a lot happier and not at all cranky and that is basically because of the fact that they are in touch with their mothers almost all throughout the day. Babies only cry if their needs go unnoticed.Crying is a much later response.A child who is fed and paid attention to throughout the day would never cry.Also, touch therapy(being in touch with the mother) helps a lot here.This is what people in tribes follow.They carry their children all day and feed them as and when they are hungry without following a particular timetable. A lonely child is an unhappy child.In today’s busy world we are so engrossed in ourselves that we actually tend to ignore the fact that our children need our time too.We often ignore our children while talking on the phone, even if it is for a minute without realizing the long effects of the same.In Tribes, a child is considered the responsibility of the whole of the tribe and not only of the parents who have given birth to the child. Well written Taran and I couldn’t agree more,thanks for sharing! Interesting read. 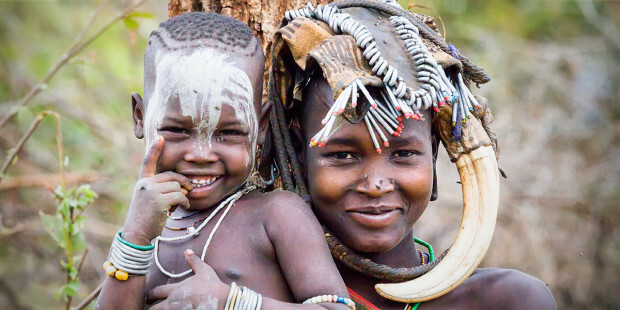 Tribal Parenting – a much new topic to be explored and researched. Lovely. Totally agree. It’s a different example you gave but so very true. So so true….keep it natural and they’ll be the best kids! This is truely an informative and a learning post !! So true. It’s about going back to the basics and adjusting our modern mommy lives in a way that some things are not compromised.